The Lifestyle Edit is a must-read for every female entrepreneur. Naomi Mdudu has given us all a glimpse into the day-to-day lives of inspirational working women like Rachel Drori of Daily Harvest and Harper Bazaar's Digital Editor, Sarah Karmali. While we all look fabulous on Instagram these days, career story features on The Lifestyle Edit show us the countless hours of hard work and emotional strength that these female creatives have put into their careers. Naomi gave up what she once believed to be her dream job to start a business that now supports so many hard working women. Read to learn more about her journey and how she helps build up her fellow females! 1. Tell us about The Lifestyle Edit! The Lifestyle Edit was born because I wanted to create a platform that firstly, celebrates the incredibly dynamic female founders and executives that make things happen behind the scenes at the many of the businesses we all know and love. But more importantly, I wanted to create a space where these women could talk candidly about their journeys and share actionable advice that our community can take away and immediately action in their lives. Looking back, entrepreneurship was always on the cards for me but when I decided to take the leap, there was nowhere for me to turn. At the time, there were fantastic resources for women in the fashion realm – but when it came to unpacking the careers of prominent women and talking in-depth about the factors that have influenced their life choices – I couldn’t find anything out there. I wanted to know how these women navigated the professional realm but I also wanted to know how their approach to wellness and both physical and mental health feeds into that. I wanted to read stories that were honest and that reflect some of my life experiences. Starting a business is scary and it can often feel isolating. The Lifestyle Edit was always designed to circumvent that by creating a community of women going through the same journey but from a wide range of different life stages, all rooting and supporting one another. It’s funny because we’re often called a modern entrepreneurial self-help destination but we’re not about being preachy or prescriptive at all. Our mission is to use these stories as a vehicle to share different lessons women have learnt along the way. I studied law in college over something ‘vocational’. I was very academic growing up and came from a very academic family so studying something like journalism wasn’t on the cards for me. Looking back, I’m so glad that I did. Studying law taught me to think analytically, write succinctly and taught me to think in a much more expansive way – great foundations for everything I’m doing now. Throughout school, I assisted a whole host of different stylists and magazine editors. As soon as my lectures finished, I’d been rushing of to prep for a shoot or jumping on the Eurostar to Paris for fashion week. I loved styling but after four years I realized that I was more drawn to words as a form of storytelling. Two weeks after graduating, I landed a job as a fashion editor of a financial newspaper (at the ripe age of 22) and worked in newspapers until I left in 2014 to start The Lifestyle Edit. Looking back, it was a huge amount of responsibility – in my first newspaper job, I was their first-ever fashion editor and in all my roles, I was fortunate enough to be given free rein to shape the editorial tone and voice of the style sections. I learnt so much from how to craft a great piece to how to manage people. I’m immensely grateful. 3. What brings you the most joy when developing your business? Hands down, the most rewarding part is being the architect of your own destiny. There’s something empowering about having the ability to actively design your life rather than living by default. As a business owner, I’m creating a definition of success on my own terms. I’m free to pivot and allow that definition to change just as often I am. Switching off is definitely a challenge as a business owner. To-do- lists are never completed – there’s always something you could be doing and there is never enough time in the day. I really began to make a shift in my business when I started becoming clear on distinguishing between ‘must haves’ and ‘nice to haves’. I started honing in the jobs that I was uniquely positioned to do, and built a team around everything else. 5. What’s your nighttime routine? I go through any flagged emails I didn’t have a chance to reply to during the day. I regroup with Anna, my operations and project manager, Anna Christie, on the status on any of our ongoing projects and touch base on anything that happened during the day that I should be aware of. I’m a morning person so I head straight to my desk in the mornings. I use after work as my opportunity to unwind and get out of my head and into my body through exercise. My gym is a stone’s throw away from home so I head over there for an hour four times a week. It’s my secret weapon for unwinding and getting out of work mode before my partner, Michael gets home from work. I do all of our food prep on the weekend, which saves me so much time in the week. It means Michael and I can have more time catching up when we’re home rather than one of us being stuck in the kitchen. We sit and talk about our day with something light on TV in the background. I check my calendar to see what’s on tap for tomorrow. I also check the weather and try to find something to wear. When I pick out my outfit the night before, it makes things much smoother in the morning. It’s hard for me to wind down – I constantly have multiple tabs open – so I have soak in the bath before devouring a good book in bed. My skincare routine has become part of my self-care practice. I use a cleanser by Sunday Riley from Space NK, toner by Aesop and a moisturizer by Tata Harper or night oil by Estee Lauder. I head to bed and do one final scroll, looking at the day’s stats, and add a note on Trello with anything important that I need to remember to do in the morning. Alarm set. Phone down. Family Guy time until I fall asleep.
. What’s one piece of advice you would give to other entrepreneurs? Get comfortable with feeling uncomfortable. 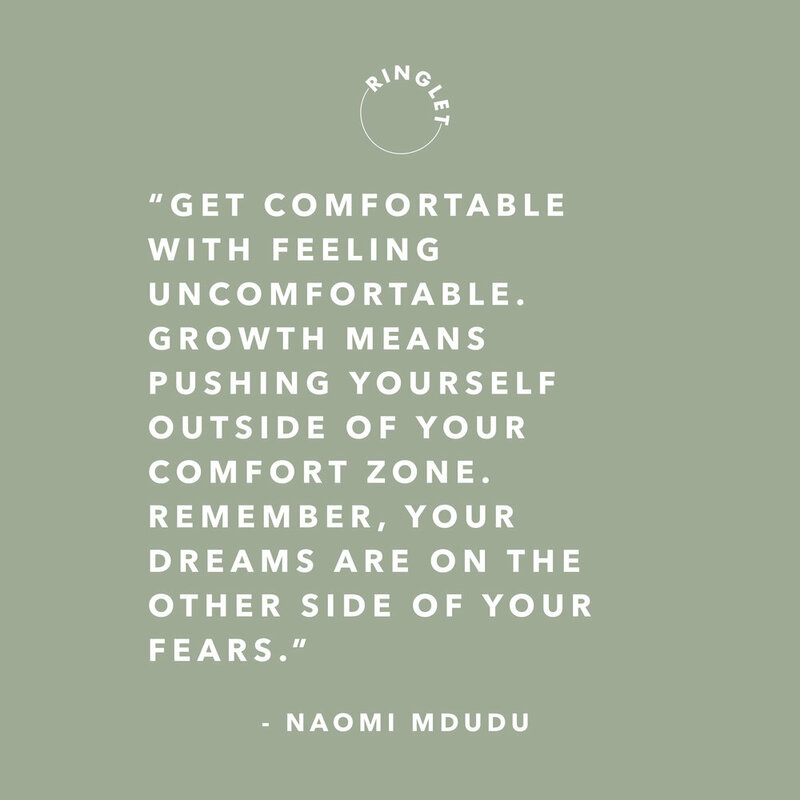 Growth means pushing yourself outside of your comfort zone. Remember, your dreams are on the other side of your fears. Courage isn’t the absence of fear but the willingness to feel fear but do it anyway. If I let fear rule my choices, I’d be in London right now working in a job that wasn’t right for me. Thank you so much Naomi. We so admire your hard work and the amazing community you've created. You can follow naomi on instagram and read the Lifestyle edit.